8 ideas for great engagement this Easter — Subsplash.com | Engage your audience like never before. With Easter right around the corner, we know your team is hard at work to prepare for a powerful weekend that proclaims the gospel and brings your community together to celebrate. As you get ready, one big question to ask yourself is how are you leveraging technology to streamline everything and maximize engagement on the biggest weekend of the year? With the right tools in place, you can expand your reach, engage your community, and make more and better disciples through the activities you already have planned. Here are a few ideas on how to incorporate the Subsplash Platform into your strategy for great engagement this Easter and beyond. It’s not uncommon to mix things up with your weekly schedules around Lent, Good Friday, and Easter. Everyone will look to your digital channels for the most current information. One of the best ways to make sure your community stays up to date with changes or additions to your service times on Easter weekend is by adding special events to your app and website. Managing your events calendar through the Subsplash Platform makes this process as simple as possible. With just a few clicks your new events will automatically update across every device and channel. After your events are published, it’s time to get the word out—and your community can help. By adding events to your Subsplash Dashboard, a sharing feature is automatically enabled and anyone can share your events on social media, through text message, and more directly from your app or website. Make it easy for your regular members and newcomers to learn about Easter by keeping the details front and center. Creating dedicated sections about Easter in your app and on your website is a great way to maximize engagement and make sure nothing gets missed. First, in your main navigation, create an Easter tab and webpage. There, you can let your audience know what to expect during all related events, where everything will take place, and how service times might vary from your normal schedule. You’ll see many first-time visitors on Easter, and these details can go a long way in making a great first impression. For inspiration, download the Interbay Community Church app to see how you can promote your Easter events, and visit the Interbay website to see a dedicated Easter webpage on a SnapPages™ website. Make sure your audience knows that the best way to stay connected with you is through your app. Announcements from the stage, digital slides during services, and links to the app stores from your website all go a long way in helping people get your app onto their devices. For those in your community who have already been using your app for a while, it may be time to remind them how to keep everything up-to-date. If you’re a Subsplash client, reach out to your Client Success Manager for free resources to help you maximize engagement with updated software and your own Apple Developer account. It’s not just about saving paper. Going digital with your welcome materials—like your bulletin and connect card—saves time and gets your audience inside your app, closer to important information and meaningful content. Don’t only think of smartphones as distractions. 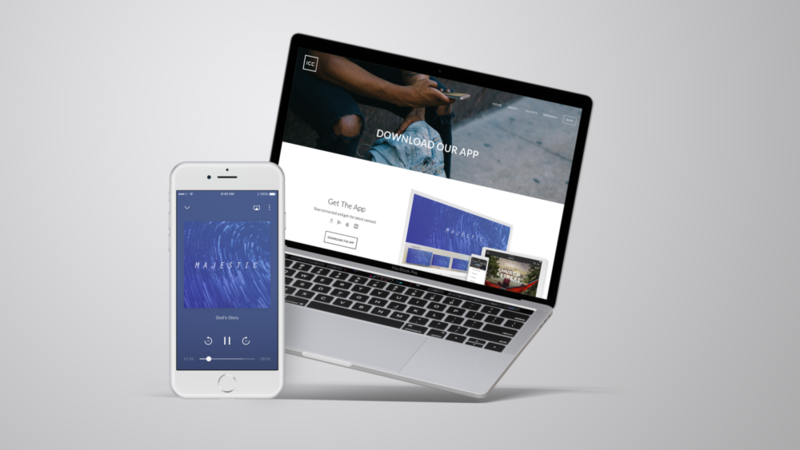 Your app—installed on your congregation’s devices—can be used as a valuable companion to your Easter service, where people can take notes, give a donation, and go deeper in community. On Easter, include a graphic promoting your app in any slideshows or media loops. Be sure that someone talks about the app from the stage and explains how your church uses it for media, events, giving, and more. This is especially important for reaching any first-time visitors, who will leave your Easter service with a powerful tool to stay connected. Getting the attention of your audience on Easter can be a challenge, but GeoEngage™ gives you the opportunity to cut through the noise with incredibly relevant messages. That’s because push notifications with GeoEngage are targeted by location, reaching your app users at just the right time and place. Here are examples of how you could use GeoEngage on Easter Sunday. Feel free to copy, paste, and customize these messages when you set up your own push notifications in the Subsplash Dashboard. Once Easter Sunday is behind you, it’s time to get your media uploaded and ready to share. Those who missed your Easter weekend services will want to catch up on the sermon, and many others may want to revisit the powerful message at a later time. Just like any events you create in the Subsplash Dashboard, one-click publishing puts your Easter media items everywhere at once: mobile apps, TV apps, and websites. It’s the simplest way to get meaningful content in front of your digital audience around the world with the best-in-class media player. Following up with your community soon after Easter is vital for staying connected, and push notifications can be an incredibly effective tool to foster this connection. Simple messages like, “Thanks for celebrating with us on Easter! We’re so glad you could join us,” can offer encouragement and prompt visitors to return for another weekend service. You can also include media items, like the sermon, or a giving link if you want to remind your audience about the opportunity to give. Easter is a powerful celebration and we’re honored to partner with you to increase engagement, expand your reach, and make more disciples. For more ideas about maximizing the Subsplash Platform this Easter, schedule a free consultation with your Client Success Manager! If you’re not already leveraging The Ultimate Engagement Platform™, let’s chat!